Microsoft built Windows, a platform that enabled people to create cool stuff, like spreadsheets, word processors, lots of enterprise desktop applications. Microsoft copied the high margin cool stuff built on Windows, and soon their software became the default. 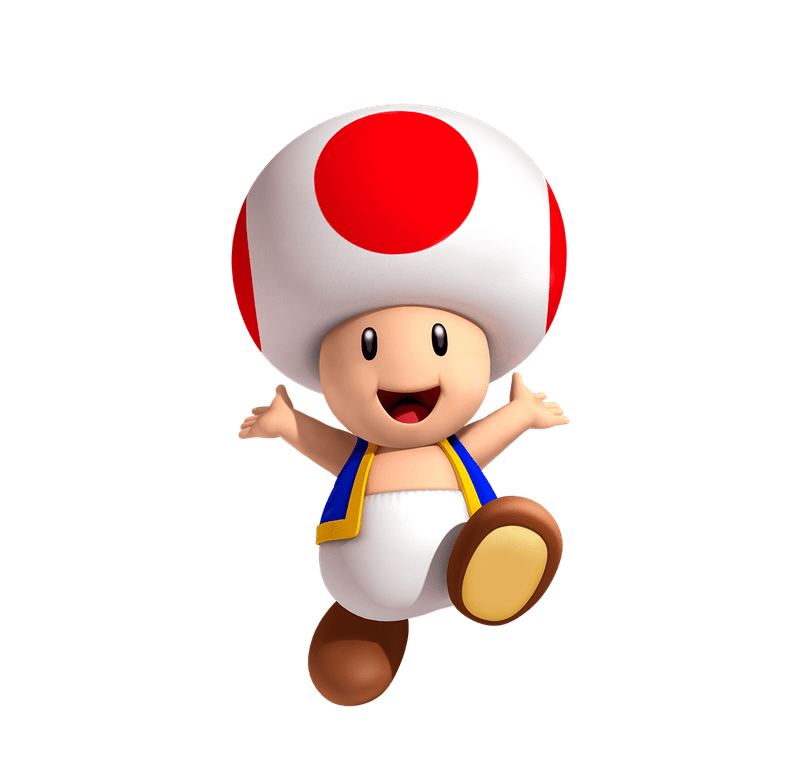 This is what we’re seeing with Twilio Flex. BTW, browsers were not high margin, hence the delay with that enterprise application. Some CPaaS providers have a UCaaS offer today, like Apifonica / Dzinga, and 2600Hz with Kazoo. VoIP Innovations is also an interesting one with its Showroom of services built on its CPaaS. We’ve discussed this trend for several years at TADSummit. This is not new, Twilio are not breaking new ground, rather they are executing better than most and dominating mind-share / SEO. For the enterprise this is great news, its the continued democratization of telecoms, again something we’ve discussed at TADSummit over the years. The per seat price for a call center will drop from $60 per seat per month in 2018 to perhaps as low as $25 per seat per month by 2020. With a few months work a small team can create a CCaaS on Flex, that’s perhaps $50-60k in development. Those are frightening numbers to those that have invested millions. But exciting numbers for many web-centric development teams. 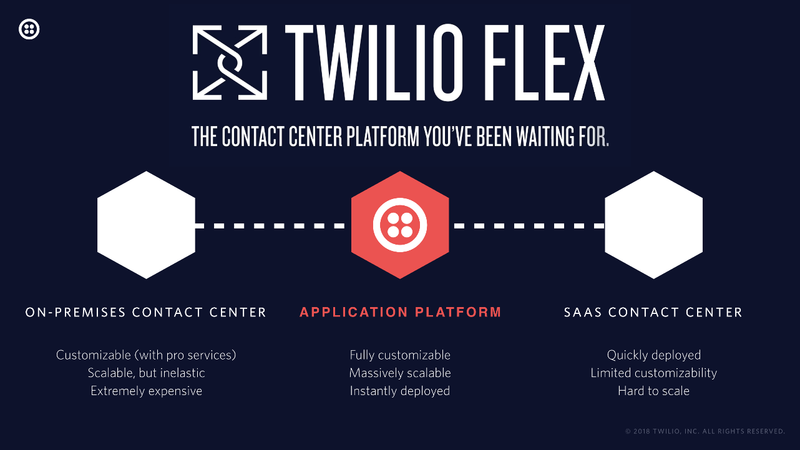 Now, if you’ve built your CCaaS on Twilio, and that is your core business, I recommend you also built it elsewhere. There are lots of options you could build on your own instance of an open source telecom app server and use a PSTN aggregator. You could use Apifonica, Telnyx, Telestax, there’s loads to choose from, check out the TADHack and TADSummit sponsors over the years. They are often cheaper with the same SLAs and in some cases better support. 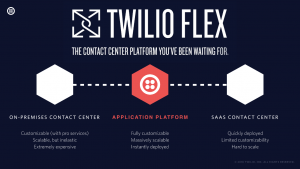 My guess as to why Talkdesk was not on the Flex ecosystem slide is they are using their recent funding to move off Twilio so they can better differentiate and not be trapped by Flex. We live is strange times, I’ve talked about Fake News in Telecoms, and we saw it where CCaaS providers like Serenova and NewVoiceMedia stood their smiling about how we all hold hands and grow the market, just like Microsoft did with enterprise desktop software 😉 I’m sure inside they are thinking on how to rationalize this to their investors. 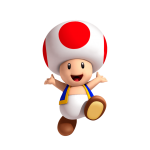 I also noticed a new phenomenon, ‘Twilio Toadies’, bloggers / analysts that go woohoo at announcements like its a revolutionary world-first. Flex is not a surprise, as mentioned CPaaS providers have been offering UCaaS for some time. Twilio has focused on the ‘big game’ of CCaaS ($60 per seat), rather than the ‘smaller game’ of UCaaS ($10-20 per seat) because they are a big company in this space that an afford the R&D. TADSummit cuts through all the silly nonsense I’m seeing from commentators. If you want to understand what is and will happen in CPaaS, UCaaS, CPaaS, UC&C, enterprise telecoms, programmable telecoms; the thought leaders of this industry gather at TADSummit for a frank and open conversation, with those unique technology/business savvy people of our industry that can sniff-out fake news in an instant. You’ll then not be surprised by stuff like Flex, nor the % of Twilio’s revenue coming from SIP trunking, nor the role of telecom app servers.